On a sunny pleasant afternoon perfect for good open rugby with a light southerly breeze ‘Ensians knew they were to have a hard game against Northumberland/Durham League 3 leaders who had already scored over 200 points this season with only 5 points against. 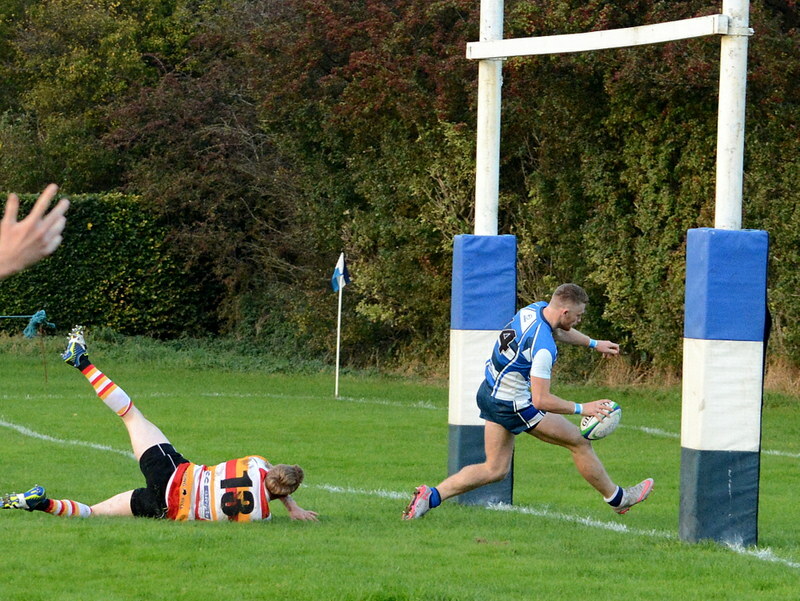 ‘Ensians backs attacked from the start with Olly Eaves making a fine break which almost ended with a score .Both teams were opening out the ball but the home backs were proving to be the stronger and after 10 minutes they again came agonisingly short of the try line. However the visitor’s forwards were ascendant in the scrums pushing the ‘Ensians pack backwards and one such scrum resulted in a penalty goal to give the visitors a 3 points lead after 21 minutes. The home team came back with a superb penalty kick by Will Cooper to take play within a few metres of the Richmondshire line but despite winning the resultant lineout the chance was lost. ‘Ensians continued to struggle in the scrums and after 31 minutes a ball lost against the head was snatched up by the visitors who scored a neat converted try beneath the posts to increase their lead to 10 points to nil. Again the home team fought back spending much of the remainder of the half in the Shire 22. Chris Westland and Olly Eaves went close but were bundled into touch by stern visitors’ defence but on the stroke of half time Connor Bateman kicked a penalty to reduce the arrears to 10—3 at half time. The second half began with a glorious move through about 10 pairs of hands but in crossing the line the home player put a foot into touch. Then after 4 minutes a lovely move across to the wing and back again resulted in an unconverted try by Connor Bateman (score 8-10).The home team had gone up a gear this half . Much of the first 20 minutes was spent in the “Shire “half but lack of ball was causing a problem ,with 2 scrums lost against the head, despite fine lineout work by Captain Sam Featherstone. Play continued to take place in the opponents half but a combination of strong defence and passes going astray kept the home team at bay. Moreover on a rare foray into the home half on 31 minutes the visitors were awarded a penalty wide out beyond the 22 which their fine goal kicker converted to make the score 8-13 in the favour of Richmondshire. ‘Ensians continued to attack but just could not get over the line. The home supporters were saying it was not their day but the team believed otherwise and with a minute to play of normal time a super move across the home backs resulted in Connor Bateman going over to level the scores. The conversion was missed resulting in extra time being needed. After a look at the rule book it was “ the golden point rule” i.e. the first to score takes the tie and from a sublime move starting 60 metres out and taken on by forwards and backs in which Rob Arbuckle featured twice who other than man of the match Connor Bateman scored the winning try. Overall a draw would have been a fair result with neither side deserving to lose but this was a fine hard fought cup tie played in a fine spirit with no quarter given or asked and the ‘Ensians “never say die” attitude won the day.. The home team had the dominating backs and the team from Richmond had the better of the forward play. Yes a great game to watch but not for those of a nervous disposition. After the game ‘Ensians captain Sam Featherstone received the “Whistlers’ Trophy” which was awarded to the Club for the season 2015/16 by the Referees Society as the most welcoming and well organised club in the North Yorkshire area.